Theresa graduated with an Honours B.A. in Fine Art, and a minor in History, from the University of Guelph in 1976. She obtained a Bachelor of Education from the University of Western Ontario in 1977. For 32 years she has taught visual arts, history and philosophy at secondary schools in the Wentworth and Grand Erie School Boards. For over 20 years Theresa was the Head of the Arts Department at Cayuga Secondary School. Since 2006, Theresa has been an active member of Grandmothers of Steel; the Hamilton branch of the Grandmothers to Grandmothers Campaign (G2G) of the Stephen Lewis Foundation. The G2G raises funds for African grandmothers to support grandchildren orphaned by AIDS. Her portrait series Faces of Africa: a fundraising initiative for Grandmothers of Steel can also be seen on Art-in-Canada. Theresa has been a member of the G2G Ontario Regions Resource Group since 2009, becoming the Grandmothers Regional Liaison for central and southern Ontario in 2011. 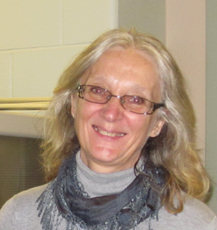 She has also been involved in the Soroptimist International of Hamilton-Burlington since 2011. Theresa currently resides south of Hamilton. 2017 "For the Love of Art", Niagara Pumphouse Arts Centre. 2015 'Art and Martinis' - Open House Group Show.